We have had a very positive start to the term with our students returning from the break with a renewed sense of enthusiasm towards their studies. It has been a pleasure to see the growth of our students over the last six months both academically and socially. Whilst we are still developing as a college, we are certainly heading in the right direction. Our Year 12 students recently completed their Externally Set Tasks. It was good to see that the students performed well in the tasks and that the external validation of the College assessment matched the teacher judgements, demonstrating our teachers excellent knowledge of the curriculum and teaching and learning practices. Well done to all involved. Our Year 12 students have been invited to a Year 12 retreat on Monday 10 September, where they will engage in activities that prepare them mentally for the final phase of their education with Fremantle College. They will engage in such activities as Mindfulness, and Exam preparation as well as a presentation from Red Frogs about keeping themselves safe after school at Leavers week. They will have the opportunity to do a range of team building challenges. It will also be a celebration of their journey with Fremantle College as the first graduating Year 12 cohort and as such has been heavily subsidised by the college. Additional important timelines for Year 12 students have been communicated to the year group and sent home to parents as we journey to the end of an amazing year for these students. This week we had our first NAIDOC week celebrations recognising the positive role that Aboriginal and Torres strait islander women have played in their culture. It was a wonderful week of celebrations and learning about the culture, art and language of Aboriginal people. I would like to thank all of the Aboriginal presenters and community members who gave up their time to share the stories and successes with the students and staff. The NAIDOC week committee and students who organised the week also deserve special recognition. I had the pleasure of meeting our second group of Gifted and Talented students on Monday night and would like to congratulate the students on gaining entrance into the Academically Selective program. This is by far the most challenging of programs to gain entrance to. I would like to thank our current students for sharing their journey in the program with parents and students. The majority of our programs are already at capacity or have waiting lists to gain entry into for next year, which is a positive affirmation for the staff and students who have made these programs such a success. I know that our community will make our new students feel welcome when we undertake our transition program next term. I trust you will enjoy the articles in this edition showcasing the many and varied activities of our students. On a final note, I would like to thank the community for their support as the strength of our college builds momentum and works towards the future. This term we held a parent volunteer night. If you would like to register your interest to volunteer at the college, we will be forwarding a booking link home soon via email. 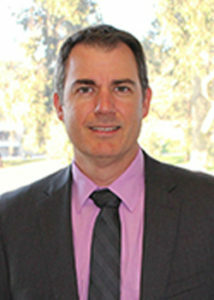 As an Independent Public School, Fremantle College has a College Board which contributes to the vision for the College and reflects the aspirations and needs of the community. The Board can have an important influence on the direction of the College, with members bringing ideas and expertise to strategic planning and community partnerships. The Fremantle College Board has a broad range of members with varied skills, including parents and community members with backgrounds in Education, Local Government, Business and have strong relationships in the local community. The College is represented by teachers and student leaders whose insight and input has been valuable to the activities of the board. 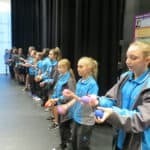 Our Year 7 Performing Arts Academy students have been involved in a range of exciting activities during Term Three. 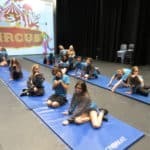 Our drama students have been enthusiastically developing skills in circus and clowning. This included specific techniques in tumbling, juggling, balancing and slapstick routines. Currently, our students are applying these newly learned skills towards a series of small-group self-devised circus and comedy routines for assessment. Our music students are busy with the beginning stages of preparing their first collaborative musical theatre item, which they will be performing with selected specialist music students for a couple of exciting upcoming events in Term 4. They have also been busy developing their theoretical music knowledge and keyboard skills to support their musical development as they move into Semester Two. Semester One concluded with a hugely successful Performing Arts Night where these dedicated students showcased their versatility and talent through selected scene work and songs to an appreciative audience of family and friends. The Fremantle College lunchtime Drama Club continues in Term 3 allowing our Performing Arts students to refine their skills in improvisation (including theatre sports) and general acting techniques. 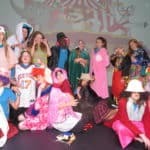 Drama Club provides a wonderful opportunity for students to mix with a range of students from other year levels, who are passionate about performance. 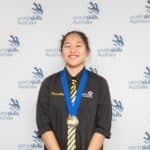 Fremantle College would like to congratulate year 12 student Anne Kyla Bautista for winning a gold medal in the 2018 World Skills Australia National Championships. 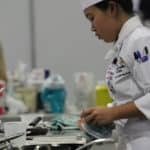 This competition took place at the International Convention Centre (ICC), Darling Harbour, Sydney 2-4 June, as part of the Skills Show. Anne Kyla studied a Certificate II in Kitchen Operations at South Metropolitan TAFE in 2017 while she was in year 11. Anne Kyla then went on to win a medal in Commercial Cookery in the State competition, which led to an opportunity to represent WA in the Australian competition, of which she won a gold medal. Anne Kyla is using these wonderful skills she has gained from her TAFE course to now work at Sweetwater Rooftop Bar as a part of her Workplace Learning Course at Fremantle College. We are sure there will be many more opportunities for this very talented young lady. Congratulations to the 16 year 10 students who completed their PADI Open Water Diver Certification in Coral Bay. These students completed two confined dives and four open water dives, demonstrating a range of required skills and knowledge. Well done to the entire group of 25 students who represented the College with distinction. 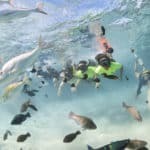 All students and staff had a memorable experience with some of the highlights including swimming with Manta Rays, Hump Backs, Sharks, Turtles, Rays and Dugongs. 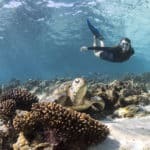 The students were amazed at the wonder and diversity of the Ningaloo Reef. Students also took some underwater scooters out to visit ‘Ayers Rock’ – an enormous piece of coral in the bay that is over 2000 years old! Special mention to Matt Freckelton who won the ‘race around the rock’. Well done. In Week 1 of Term 3, our specialist music students were treated to a workshop and performance by world renowned Indian Classical Music Scholar, Dr Sadanand Mankar. 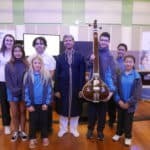 Dr Mankar gave us a fascinating introduction to the instruments and concepts that underpin Indian music and some of the philosophies that inform these. Our students were guided through clapping complex rhythmic patterns and singing ragas. Dr Mankar will be leading weekly workshops for a small group of specialist students throughout this term. 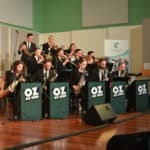 The OZ Big Band wowed a packed auditorium on Thursday 9 August in the latest performance in our workshop series. Just back from a tour to Canberra, the band polished up sections from a few numbers in an open rehearsal under the careful guidance of Musical Director Adrian Hicks and, after a brief interval, gave a whistle stop tour through the history of Big Band music in a performance. Students and parents from the Specialist program and our primary IMSS program were blown away as the band demonstrated why they are considered one of Australia’s top Jazz Orchestras. 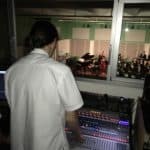 The band were impressed by our facilities in the Calvert Music Centre and met some of our specialist students who were recording the event from our recording studio. “Can we rehearse here instead of WAAPA, it’s much nicer!” commented one musician. Specialist students now have the opportunity to win two prizes as we are running a competition to see who can produce the best ‘mastered’ version and the best ‘remix’ of a recording from the night. We are excited to see what our students come up with. On the 25 July, 25 prospective year 6 students made their way down to Fremantle Oval to trial for the Fremantle College Football Academy for 2019. With the trial scheduled to start after school, the heavens opened up and the rain came crashing down right as the final bell of the day rang. The weather meant that we were confined to the South Fremantle Football Clubrooms, where the students and their parents/guardians heard from Tom Bottrell (SFFC and Stephen Michael Foundation CEO) and Paul Mugambwa (Stephen Michael Foundation General Manager) about the amazing program that they were hoping to embark on, should their application be successful. Shortly after the information session, the students made their way into the main hall to complete some quick hands drills with Ms. Traynor and Mr. Basile. With all the students enthusiastic to put their best foot forward, it was great to see how keen they were to listen and give each drill their best effort. Well done to all students that participated in the trials, it was great to see the exciting talent that we have coming through in years to come. If you are someone who is interested in joining the Fremantle College Football Academy for 2019 it is not too late to apply. Please contact the College and make enquiries about how you can be involved in the program for 2019. Free Friday afternoon sport is coming to the City of Fremantle at Fremantle College through the form of Night Fields. Night Fields is an AFL and basketball based activity delivered to kids and youth (aged 6-18) after school hours, with the aim of encouraging positive community engagement and participation, developing healthier individuals and reducing anti-social behaviour. Each participant will receive afternoon tea at every session and there is also a good chance of receiving various giveaways throughout the 5-week program. The program begins on Friday 24 August, commencing at 3:00 pm until 4:30 pm. For more information, please see the attached flier or contact Mr. Tim Basile (timothy.basile@education.wa.edu.au) or Ms. Michelle Traynor (Michelle.Traynor2@education.wa.edu.au) at the College. 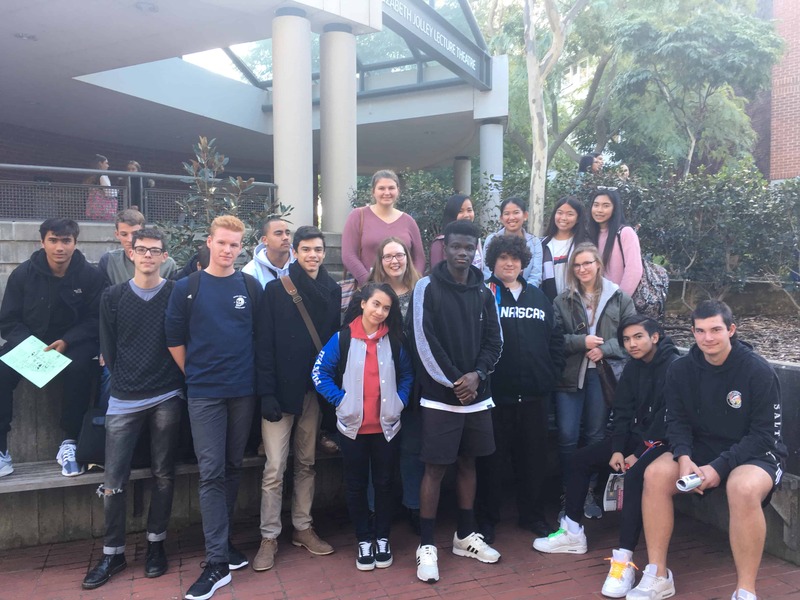 At the end of Term 2, the Year 12 ATAR English students attended the annual Curtin English Conference. 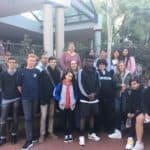 The excursion gave students a chance to experience University life, while attending a range of lectures to support their English studies and exam preparation. The next round of OLNA testing starts in Week 7 this term, on the August 27. Students in Years 10 – 12 who need to complete the OLNA testing will be offered an intensive online support program over the next few weeks, with details coming via English and Maths classroom teachers. Students are encouraged to attend Wednesday homework classes in the English block from 3 – 4pm for additional support. 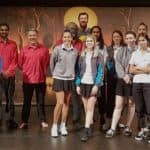 At the beginning of this term ten Fremantle College students, made up of five Follow the Dream students and five of their friends, attended the Octagon Theatre at UWA to watch Bindjareb Pinjarra. This thought-provoking piece of theatre has been performed around Australia since the mid 90’s and has a mixed cast of both Nyoongar and Wadjella (whitefella) actors. It details the massacre of local aboriginals in Pinjarra during October 1834 whilst contrasting it against the modern-day reverberations and consequences. Using a mixture of comedy, slapstick and improvised theatre, Bindjareb Pinjarra portrays both sides of what occurred in Pinjarra, whilst noting that much of this history has been ‘whitewashed’. 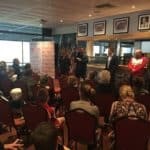 It highlights the need to educate our current and future generations of our shared history regarding the impacts of English settlement on Aboriginal land, and what this would mean for the future of Australian culture. The performance was thoroughly enjoyed by all and had a significant impact on the students who attended. It raised important questions and thoughts about how we can improve our education moving forward. If you get the chance it is well worth the watch! Our inaugural NAIDOC assembly at Fremantle College was absolutely outstanding. Working together with some amazing people since beginning of Term Two has clearly shone through during the assembly. From the slideshow highlighting strong inspirational woman and their families, to our guest speakers Sharna Walley and Stephen Michael – their stories gave us much to think about. Thank you to Heidi Mippy – you definitely touched our spirits. Special thanks to East Hamilton Hill Primary School year 6 students. Their performance of Wandoo was a great way to end our assembly. I am so very proud of the group of girls who helped bring this assembly together, a huge thank-you and well done. These young students are role models to their peers, they looked amazing in their shirts which were designed with the helped of Michelle and Maddie from our Art department. Thanks so very much ladies, you helped me to bring about the vision I held. From our Master of Ceremony Kerry Hayden to Annali Mippy-Smith who alongside her Nana Dawn Smith gave the Welcome To Country. Our National Anthem was sung by Emily Henney and Chloe Maynard accompanied by Rueben sang ‘Halleluiah’ beautifully. Tigerlily, her brother Trevor Ryan, Tyler Sebastion and Larsharna Woods carried the Aboriginal and Torres Strait Islander flags for our ceremony. Sharing the story behind the colours and their meaning. The ushers who greeted our guests and parents have been a credit to Fremantle, in the professional manner in which they addressed each one. Shalorna Dykman-Mippy, Shakayla Ugle, Talei Chadderton, Lara Ninyette and Shay Oxenham thank-you. Nathan Dines I thank-you personally for all your help and support. Nathan has worked tirelessly with Cheryl and Des Lawson who are creating an artpiece which can be viewed from Lefroy Road. Please come along and see this. Thank you also to Mike Gowland for assisting us in bringing the music all together on the day. Ladies from Home Economics who set up the staffroom ready to welcome guests and parents. Our teacher Kelly Drake who with her students made a delicious variety of scones thank-you. Our NAIDOC celebration week has started off highlighting the extraordinary talents of our Aboriginal students. 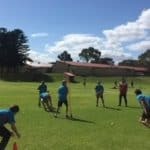 Each day we had various events happening, concluding the Dr Robert Isaacs Football Carnival on Friday 17 August in association with Wirrpanda and Fremantle College. We will host the girls from Gilmore and Yule Brook Colleges in a round robin competition. Our girls have been training hard for this day and I look forward to seeing their families come along and support them. I am grateful to all the hard work and support from the Aboriginal Education Team and staff. Thank-you. 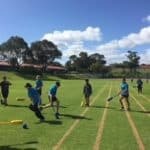 On Wednesday 15 August, the staff from the Stephen Michael Foundation and Nyoongar Wellbeing and Sports were welcomed to Fremantle College to run traditional Aboriginal games for our lower school Physical Education classes. Our students were all provided with a brief description of each game, including its origin and how it was traditionally played. Moving around in small groups, the students all had an opportunity to try each game. The atmosphere on the oval was amazing, as students from year 7 to 10 participated in each game, enjoying the unique opportunity to try games that they had never played before. 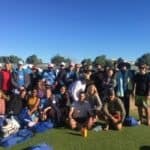 Thank you to the staff of the Stephen Michael Foundation and Nyoongar Wellbeing and Sports for being a part of our NAIDOC week celebrations at Fremantle College. The staff and students all had a fantastic day! On 17 August, Fremantle College hosted Yule Brook College and Gilmore College for a female AFL carnival as a part of NAIDOC week celebrations. The students that played for the Fremantle College team have been training with the Deadly Sistas and Meryl Oltmans each Wednesday. The first game kicked off at 10:00 am and we had many supporters come down and cheer on the girls!